Congratulations on your election victory, although it’s a pity that the betrayal of your Caesar was not more “Brutel”. We are somewhat bemused by your new appointment given that you have just sworn to give your best advice to the President but say you need “technicians” to advise you. What happened to meritocracy? Perhaps this is an inevitable consequence of a National Assembly over-laden with lawyers. Will you ensure justice for future generations? We hope so. Yours is an important Ministry because Mauritius is under existential threat from the unrelenting combustion of fossil fuels. How will life be when our beaches have disappeared due to sea level rise and Port Louis is regularly flooded? You need to get out and convince fellow Ministers around the world to speed their transition to cleaner energy. But how can you do that if you support coal? We propose a way out: enact a legal moratorium on additional coal-burning power stations. This force majeur will permit the CEB to renege on its coal supply and power purchase agreements with CT Power without liability – and considerably increase your political capital. Otherwise, if we lose hope for our future, what do you think will happen to yours? Fossilised thinking within your Ministry and the CEB undermined the objectives of Maurice Ile Durable. We were promised a renewable energy revolution only to find that existing strategies were written in stone. Your “technicians” are stuck in the steam-age. Sack them. We have ample forward-thinking, under-employed young graduates eager to fill their shoes. The future is bright; the future is solar. The only challenge with photovoltaic electricity (PV) is matching instantaneous supply with demand. Before too long, cost effective electricity storage solutions will become available. Until that time, there are many things we can do to integrate as much PV into the existing grid as we can – along with a few more wind turbines. This means being able to rapidly increase/decrease electricity generation from other sources – and gain greater control over electricity consumption – in order to compensate for the inherent variability of sunshine and wind. Subsidise flexible, on-demand sources of electricity because each extra megawatt permits at least an additional megawatt of PV and wind turbines. Terminate subsidies on PV because patriotic citizens are ready to install it at cost and it will only get cheaper. Halt the construction of PV “farms” on green field sites because agricultural land is precious and there is more than enough space on top of buildings. Encourage the use of electric vehicles with smart chargers because they can help match supply with demand and they are the only form of transport that can be powered by the sun and wind. End subsidised electricity prices to industry because it discourages investment in saving energy, for example: insulation, solar water heaters and heat pumps. Allow people to opt out of having a highly reliable supply and give them cheaper electricity for accepting occasional blackouts; offer it to industry too. The flexible on-demand source we suggest is bio-methane produced by the anaerobic digestion of organic matter. We can use the same technology that is employed at Mare Chicose landfill and St Martin waste water treatment facility. As a matter of priority, it should be installed at the other waste treatment facilities. With the infrastructure in place, food waste can be easily added to increase bio-methane production. We will persuade our friends and families to segregate it – you persuade the local authorities to collect it. To increase production even further, energy crops – more efficient than sugar cane – can be grown near the waste treatment facilities and fertilised by the residue from the digestion process. Until electricity storage becomes widely available, the best place to store the sun’s energy is Nature’s way – in plants. Your “technicians” told your predecessor that if electricity in Mauritius were a bed, then the mattress should be made from coal, with clean energy merely a thin sheet on top. Should we let sleeping dogs lie? No! It’s already the eleventh hour and time to awaken the dreamers. Wouldn’t you be the first to confess that your inadequate qualifications render you incompetent to judge the merits of our case? Let us contend openly with your “technicians”. Give us the chance to counter their claims and we will give you the confidence to develop a credible, affordable and just Renewable Energy Master Plan. We are sorry if you feel scandalised by being petitioned in this way; but we have been appealing to deaf ears for years. From the title of your election manifesto: “Gouverner pour le peuple – avec le peuple”, you have encouraged us to believe you are different. We trust this will not prove to be electioneering hypocrisy. As you well know, the final judgement – in any democracy – is delivered by the court of public opinion. We are Legion. We do not Forgive. We do not Forget. We Love Mauritius. With global warming and an ample sun and wind supply, this is what needs to be considered and implemented. And what about wave power, especially in the south? Sun and wind can be utilised with well established technologies. Waves are proving a little more difficult to harness. Blame the white horses??? We have the youths of this Republic with the required brains to steer the Energy policies. Those involved in this genuine project should be taken on board. Commendable draft Petition with the Required Grid. Bonne chance Mauritius. I wonder our island being among best located on the globe, we are favoured with sun, waves, fertile soil and winds..why do we have to pay high prices for electricity produced by coal..we hv south east trade winds, we have sunlight all over the year, we hv unprofitable sugarcane field..all free gifted natural ingredients.Why cant we collect our energy for use at domestic level through well planned policies.? Why do we have to pay such high costs for purchase of coals to produce electricity? Our new Minister of Education should have new “strategies” in keeping wiz this orientation. Thru colleges instigate new approach to Green energy to inspire the rising generation……. sources alternative to fossil fuel. Was RamGooLam the BBC’s April fool? Say NO! 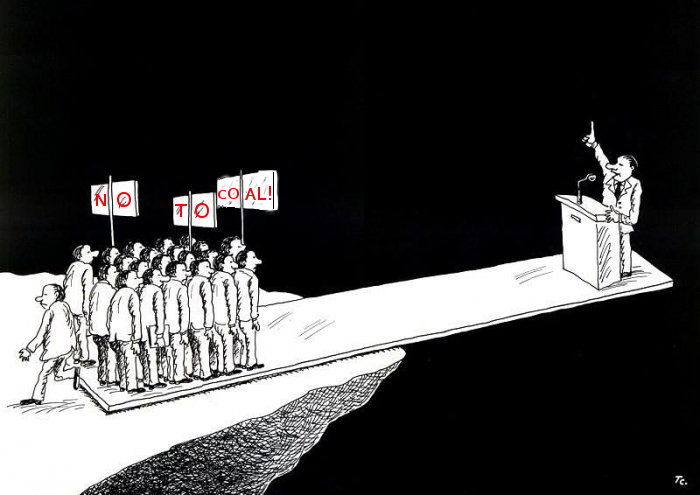 to coal – And yes to what? A Hidden Message from the Governor of the Bank of Mauritius?